The book argues that we can have a safer and healthier banking system without sacrificing any of the benefits of the system, and at essentially no cost to society. Banks are as fragile as they are not because they must be, but because they want to be–and they get away with it. Whereas this situation benefits bankers, it distorts the economy and exposes the public to unnecessary risks. Weak regulation and ineffective enforcement allowed the buildup of risks that ushered in the financial crisis of 2007-2009. Much can be done to create a better system and prevent crises. Yet the lessons from the recent crisis have not been learned. The Bankers’ New Clothes seeks to engage the broader public in the debate by cutting through the jargon of banking, clearing the fog of confusion, and presenting the issues in simple and accessible terms. It calls for ambitious reform and outlines specific and highly beneficial steps that can be taken immediately. Providing a sound analysis of the role of banking and its regulation in the public interest, The Bankers’ New Clothes is free of technical jargon and widely accessible to all policymakers and all who are concerned about banking’s future, which is virtually everybody. The book’s clear exposition conveys a deep understanding of the pervasive place of banking in the economy and stands in opposition to the self-interested forces of obscurity. 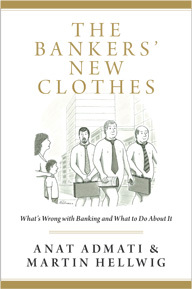 Anyone interested in the past, present, or future of banking and financial crises should read The Bankers’ New Clothes. Admati and Hellwig provide a forceful and accessible analysis of the recent financial crisis and offer proposals to prevent future financial failures. While controversial, these proposals–whether you agree or disagree with them–will force you to think through the problems and solutions. With extraordinary clarity, Admati and Hellwig explain why the banking system is reckless and distorted, what can be done to tame it, and how the politics of banking has failed the public. A must read for all, The Bankers’ New Clothes educates and thus empowers citizens to demand a better system, and tells policymakers how to deliver it. This entertaining book is an accessible exposé of the myths that financial firms use to perpetuate the advantages they get from government guaranties of their debt. A must-read for concerned citizens, The Bankers’ New Clothes should be studied and memorized by lawmakers and regulators so they won’t be duped by these false claims in the future. At last! Two eminent economists explain in plain English what is wrong with banks and what needs to be done to make them safer. This excellent book should be read by everyone concerned with banking systems. Legislation has not removed too-big-to-fail financial policies, continuing the mistake of making innocent citizens responsible for bankers’ errors. The Bankers’ New Clothes makes the case for increased equity capital and answers bankers’ arguments. Allan H. Meltzer, author of A History of the Federal Reserve and Why Capitalism? Almost subversive in its clarity, The Bankers’ New Clothes is the most important book about banking in a very long time. It argues that as long as implicit taxpayer guarantees incentivize banks to raise funds almost exclusively through issuing debt, the global financial system will be subject to periodic destructive crises. The most effective remedy is to force banks to strike a better balance between debt and equity, but there have been many obstacles to implementing this improvement. Future efforts to regulate the financial system should start here. With a knack for explaining complex concepts in a very straightforward fashion, Admati and Hellwig take readers on an immensely rewarding and often surprisingly amusing journey. Their brilliant book has much to offer everyone, from novices to experts. Admati and Hellwig are on a mission to teach citizens, policymakers, and academic economists about the principles of sound banking practice and regulation, as well as the pitfalls and immense social costs of failing to abide by those principles. Much economic pain–such as the U.S. savings and loan crisis of the 1980s and the 2007-2009 financial crisis–could have been avoided had policymakers and the economists who advise them understood and implemented crucial fundamentals.